In my review of Nonviolent Communication, I also neglected to cover anger. And since anger is a big part of my life right now, it’s worth it to me to dig into it. Rosenberg encourages us to express our anger fully. I would suggest that hitting, blaming, hurting others—whether physically or emotionally—are all superficial expressions of what is going on within us when we are angry. If we are truly angry, we would want a much more powerful way to fully express ourselves. The first step in expressing our anger is to divorce the other person from any responsibility for our anger. We are never angry because of what others say or do. Others can provide a stimulus for our feelings, but not the cause. And it is important to establish a clear separation between the stimulus and the cause. This is like Greek to me. I like it! Rosenberg says that it’s easy to equate the stimulus of anger with the cause in a culture that uses guilt as a means of controlling people. In such cultures, it becomes important to trick people into thinking that we can make others feel a certain way. This is the cause of anger. When stimulated to anger, we turn off that feeling of anger by focusing on our own needs and feelings or the other person’s feelings and needs. So isn’t anger sometimes justified? To this Rosenberg says that rather than agreeing or disagreeing on the righteousness of anger in different situations, we serve life better by focusing attention on what we are needing. When we judge others, we contribute to violence. And remember it’s important not to judge. If you put a label of “wrong” on anger, you are judging. It’s better to be inquisitive about anger. What are the thoughts that are fueling the anger? Step back. What needs aren’t being met? How do you feel? Scared? Violence comes from the belief that other people cause our pain and therefore deserve punishment. People trick themselves into believing that pain derives from other people and that consequently those people deserve to be punished. Hmm, I’m still struggling with this. I still think those neurologists who were so callous with my husband need to be punished. I guess somewhere I’m not following. I understand how my unmet needs made me angry and the neurologists didn’t meet my needs and I’m still angry—at the neurologists. I suppose I could find out what the unmet needs of the neurologists were, but they weren’t seeking help. They weren’t in a vulnerable situation, as was my husband. I can make all kinds of justifications for them and it still comes down to they had a sacred duty and they shirked it. I don’t really care why. I don’t care about their needs. They took our money and our insurance’s money and they didn’t render the service we needed them to render. I want my money back and I’m still angry. I guess though, the NVC process helps me from being blinded by anger. It has a calming effect. A slowing effect. Ah, so maybe here is what I’m missing. I need to express the feelings and needs to the neurologist. I need to be heard. I need to know that they know. Ah, I need the other party to connect with what is going on in me. But before those nasty neurologists will be able to hear me, I have to first empathize with what leads them to behave in the ways that are not meeting my needs, or the needs of their patients. I need them to make it right. But warning: as soon as people think that they have done something wrong, they will not be fully apprehending our pain. People do not hear our pain when they believe they are at fault. If we sense blame entering their mind, we may need to slow down, go back, and hear their pain for a while more. I reviewed Nonviolent Communication and didn’t touch on empathy. I wanted to add this post because I believe the information on empathy that Rosenberg gives is so critically important. It can be impossible to communicate completely with someone when they don’t know how to be empathetic. Sometimes, you just need to vent. Sometimes, you just need to be heard. Oh man, I am guilty of doing so many of these when I really wanted to be there for someone, but didn’t know how. Now that my husband’s condition is so much on the forefront of my reality, I cringe at some of these when they are directed at me. This communication language thing is very hard. We know a speaker has received adequate empathy when we sense a release of tension or the flow of words has come to a halt. When we can’t give empathy to others, it’s a sign that we need to give empathy to ourselves. When we can speak our pain without blame, even people in distress can hear our need. So why is empathy important? Empathy allows us to reperceive our world in a new way and to go on. And empathy gives us strength. When we listen for feelings and needs, we no longer see people as monsters. NVC mourning: connecting with the feelings and unmet needs stimulated by past actions we now regret. There is incredible memoir fodder in the statement above. By Haruki Murakami; Knopf, Random House; @ 2007; Translated by Philip Gabriel in 2008; 180 pages. I recently went on a book binge. I was in the local used bookstore with my credit card and no supervision. Murakami’s book was one of about seven or eight that called to me from the shelves: Hey, you, over here! I read Murakami’s After Dark while I was in grad school, and though I loved his style, I didn’t really care for the story. Murakami’s best known work is The Wind-Up Bird Chronicle, and I can’t wait to read it. Before I go on, you should know that I do not run. Never have. Ever since I was a kid and was secondhand inhaling five packs of cigarettes a day, I have not been a runner. But back to Murakami. I like this guy. He says most people don’t like him because he isn’t willing to compromise. That makes me like him even more. He’s in his late 50s as he writes this memoir. He says he started writing novels in his 30s. His secret? He runs every day, or at least every other day, and he runs a marathon once a year. As he describes training for the New York City Marathon, he drops pearls of wisdom about writing. He says the most important qualities of a novelist are talent, focus, and endurance. A novelist has to focus for three or four hours every day for six months to two years. Running helps him maintain his endurance. I had a hard time understanding exactly what Murakami meant by that, but he goes on to say that it can be related to the fugu fish. The tastiest part is near the poison. He says that with older writers it’s harder to maintain the balance between imaginative power and the physical abilities that sustain it. When that happens, some writers commit suicide. I’m not sure I agree with this entirely. I think that when writers open up their subconscious and remove those protective barriers to lost memories, feelings, etc., that what comes out can be so startling and overwhelming that they can fall into a clinical depression. The actual chemistry of their brains is affected to such an extent that they can’t handle it emotionally. Perhaps running provides a mechanism to cleanse the brain of the chemical toxins generated by introspection. Maybe vigorous exercise is needed to keep the brain healthy. Maybe, or maybe not. 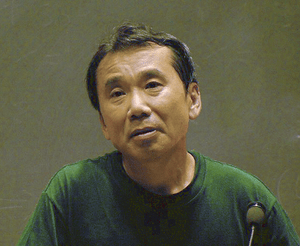 Murakami says that some people think he’s obsessed. Hmm, marathons every year for 25 years and then completing a 62-mile race in one day? Maybe. But there are worse things to be obsessed about. At least he balances his obsession for running with his obsession for writing. I felt sorry for him, not because he couldn’t reach the time he wanted to obtain, but because he seems to beat himself up about it. I think anyone capable of running a marathon in his late 50s and early 60s has nothing to be ashamed of, even if that little old lady did pass him up.